London junk food joint MeatLiquor has teamed up with Queens Skate Dine Bowl to launch an adult-only bar and bowling experience inspired by the ’90s film The Big Lebowski. 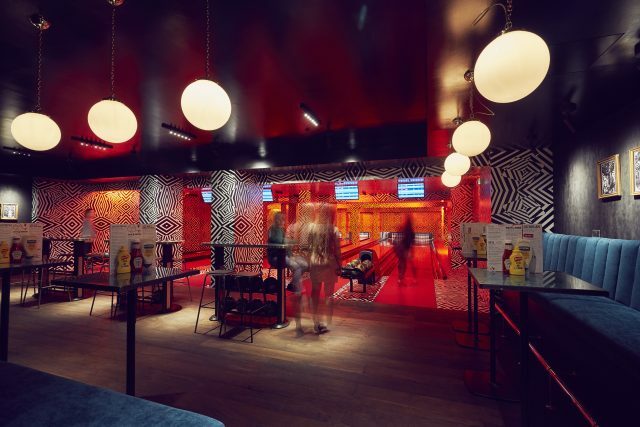 Called The Liquor Lanes, the new private venue will open on 21 February, complete with five ruby-red bowling lines, geometric wall designs and MeatLiquor’s trademark burgers and cocktails. Inspired by the trip scene in the film, Liquor Lanes will be located within Queens’ existing site in Queensway. The area also has a private bar and sound system. Dishes include deep-fried mac n cheese with marinara sauce; sticky chicken wings with a honey and French mustard sauce and MeatLiquor’s signature hot mess consisting of hash browns with blue cheese sauce, jalapenos, buffalo sauce and pickles. Meatliquor has been serving its food in Queens since 2017, offering its full menu complete cocktails and vegetarian and vegan options. In November last year, it was announced that MeatLiquor’s original London restaurant in Marylebone would close at the end of this month. The restaurant group has since announced that it is to relocate just a few hundred metres down the road on Margaret Street. The new site will have a capacity of 300 with live music and DJs. The current restaurant, on the ground floor of a carpark, opened in 2011, originally on a two-year lease. It will officially close this Saturday (9 February).